Something Like Normal was very different from what I expected it to be – and not in a bad way at all! I don’t know what I was thinking I was about to read, but this book exceeded every single one of my expectations, and it’s made me want to read more books that have a military theme and it definitely made me want to read more of Trish Doller’s books. Travis has just returned from a one year stint in Afghanistan, and things are pretty hard for him. He’s just lost his best friend, Charlie – he’s returned to a home where he doesn’t feel like he belongs – a home with parents on the outs and a younger brother who has always wanted what Travis has. Then on top of his family issues, he can’t sleep at night due to nightmares from a traumatic event, and on one of his sleepless nights he somehow ended up at Harper’s house. 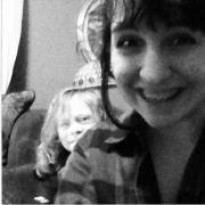 The girl who was always talked badly about due to a rumor Travis started in middle school. The thing about this book is that there isn’t any big moment where things crash down or a moment where all of the characters problems are resolved. And that may be unappealing to some, but I found it incredibly refreshing. Trish Doller didn’t reassure us that everything’s going to be okay – because really there’s no guarantee, but she did leave the story off in a hopeful manner. She also managed to tie all of the different events going on in Travis’ life together in a way that was just right. Not too overwhelming and definitely not understated. The male POV in this book was incredible! Travis was such a unique character, and I feel like since he had already gone through something so big in his life – that his voice was more realistic. He was trying to deny what was happening to him, and I really enjoyed (not to sound mean) how vulnerable he was. It was a complete role reversal from the typical YA book. Usually it’s the girl that is vulnerable and the guy that swoops in to save her. Harper (the female protagonist) in this book was a really well developed character, and was a big part in Travis admitting that maybe he isn’t as… not so much invincible, but something along those lines – as he thinks. 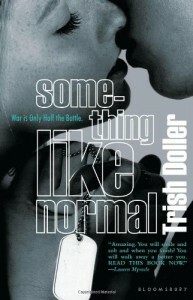 Something Like Normal is a book that I believe is another one of those must read contemporaries. It’s a fairly short story, but there’s so much packed into that 214 pages that I think everyone should read. The topic of PTSD isn’t one I’m familiar about, but after reading Something Like Normal – I’m definitely interested in learning more about it.